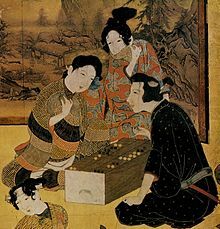 Sugoroku (雙六 or 双六) refers to two different forms of a Japanese board game, one similar to western backgammon, called ban-sugoroku (盤双六, 'board-sugoroku'), and the other similar to western Snakes and Ladders, called e-sugoroku (絵双六, 'picture-sugoroku'). A simpler e-sugoroku, with rules similar to snakes and ladders, appeared as early as late 13th century and was made popular due to the cheap and elaborate wooden block printing technology of the Edo period. Thousands of variations of boards were made with pictures and themes from religion, political, actors, and even adult material. In the Meiji and later periods, this variation of the game remained popular and was often included in child-oriented magazines. With ban-sugoroku becoming obsolete, now the word sugoroku almost always means e-sugoroku. Many Sugoroku-based video games were released in Japan, these include: Kiteretsu Daihyakka: Chōjikū Sugoroku, Sugoroku Ginga Senki, Battle Sugoroku: Hunter (SuperLite 1500 Series) (known in North America as Battle Hunter), Ganbare Goemon: Mononoke Sugoroku, Dokodemo Hamster 4: Doki Doki Sugoroku Daibouken!, Hello Kitty: Minna de Sugoroku, Gotouchi Hello Kitty Sugoroku Monogatari, Yu-Gi-Oh! Sugoroku's Board Game, Okiraku Sugoroku Wii (also known as Family Pirate Party), Hidamari Sketch: Doko Demo Sugoroku x 365, Asoberu Ehon Tobida Sugoroku! (known in North America as PictureBook Games: Pop-Up Pursuit and in Europe as Picturebook Games: A Pop-Up Adventure), among few other titles. The video game Samurai Warriors 2 features a mini-game named Sugoroku, but it bears very little resemblance to the above described games. Instead, it plays very much like Itadaki Street, Wily & Right no RockBoard: That's Paradise, or a simplified version of Monopoly: players take turns in moving around a board, the spaces of which are designated as different territories of Japan. By landing on an unoccupied space, the player is able to buy that space for a set amount of money. If one player lands on a space purchased by another, they must pay a fee to that player, or else can choose to challenge the player for control of that space (utilising the main Samurai Warriors 2 game engine for special challenge games). Also present on the board are "Shrine" spaces, which are roughly analogious to Monopoly's Chance and Community Chest spaces.